Commercial waste removal Sydney: Mr Waster attended the annual AWRE waste and recycling expo in Sydney Olympic Park yesterday to keep up to date with all the latest technologies and processes aimed at driving improved recycling and cost minimisation for Sydney based commercial waste customers. In 2019 – it is more important than ever to be fully aware of all the recycling options available for your business – to ensure you keep costs down, and keep recycling rates high. This is more important than ever in light of the ongoing recycling crisis – where China is turning back low grade recycling – and ever increasing landfill levies. With the general economy entering a downturn in early 2019 – you have to keep costs low in your business! As a Sydney based business, you will need to organise your own commercial waste removal service if the local council can not meet your needs. Most councils are phasing out their commercial waste services gradually, and those that remain usually offer only smaller bin sizes such as 240 litre and 660 litre as a maximum. If your business is getting a bit bigger, you will need to organise your own commercial waste services. In this brief blog post we highlight three tips for getting a great service at an excellent and reliable price. 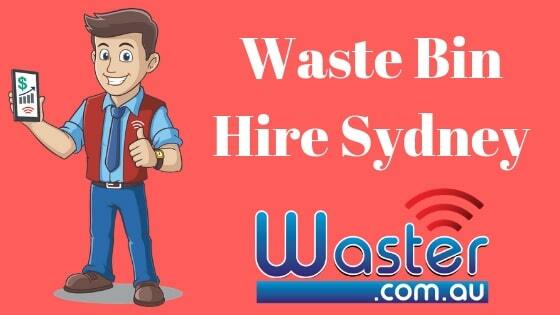 Note: Waster offers comprehensive commercial waste and recycling services to businesses in all major Australian metro regions including Sydney (we cover the entire metro Sydney area), Melbourne, Brisbane, Perth, Adelaide, Darwin, Canberra, Hobart, Gold Coast, Newcastle and the Central Coast. You do not know if you are getting good value for money until you check the market prices. Through Waster’s transparent approach to pricing (check out all our inclusions here) you can be certain that what you sign up for is what you will pay in the end. All our services have no hidden fees such as rental or site fees. We also do not increase your rates multiple times per year like by other providers. When signing a long term contract, you always have to be careful that the small print will not let your provider increase rates significantly. All Waster services are delivered on flexible 30 day agreements. You only need to provide 30 days notice if you intend to cancel your services at any time. This is totally different to other commercial waste removal Sydney companies who will seek to sign you to a 2-3 year contract with rollover clauses. We really believe this approach will enable your business to have additional flexibility and confidence in your waste supplier. Our flexible services cover all waste streams from general waste to feminine hygiene bins. Tip Three: Engage a supplier who can deliver all recycling services to reduce your costs. Waster offers comprehensive waste and recycling services covering general waste and all kinds of recycling such as cardboard, commingled as well as services such as medical disposal, sanitary bins and grease trap. Having all your services provided under flexible 30 day agreements eases your business stress and simplifies your process. Other providers, who only operate general waste services will not be incentivised to increase your recycling performance as it will decrease their profits. Jump on our online waste services shop to check all your required services and associated pricing for commercial waste removal Sydney – simply press the blue button below to go to our online portal.